-Uses many items like Eul’s Scepter, Guinsoo’s Scythe, Lothar’s Edge, Dagon, Necronomicon, Flasks, Portals etc. -Has a mechanism that prevents them from getting stuck, charge alone, walk through invulnerable towers etc. 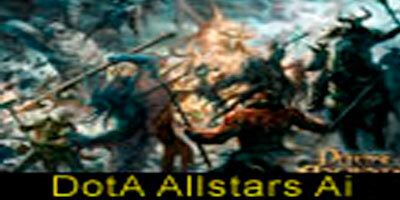 -Most skills are used properly, even uses some combos like Blink-Stomps, Decrepify-Dagon etc. -Evades Meat Hook, Elune’s Arrows, Fissure and tries to stay away from Midnight Pulse, Macropyre, March of the Machines, Black Hole, Illuminate etc. -Kotl uses Illuminate when it is safe to do so, if kotl is attacked while channeling, it will cancel illuminate and run away. However, it still is a free target of Meat Hook, Midnight Pulse and the like. Superb map i wish there is a 6.40 AI by RGB. respect man respect for this awesome map. zomg this AI pwns my nads. my friends and i had to work to be able to beat normals. one day we will pwn insanes. i doubt you’ll keep updating this, but it’s been real. when will more updates from RGB come ?!? I only use it now for a real practice, the official AI does quite cut it for me. kudos to you, RGB !